As mentioned in my last post, I am so loving green polishes this Holiday. And, I’ll say it again, green polish is new to my life in the past 2 years. I must have been in some rut, avoiding wearing green polish. I would wear it on my toes but, just not on my fingers. Too funky. Three random, Holiday greens. Using the last photo, from the left: from Color Club’s Under The Mistletoe collection in 2009 (no name); Orly’s ‘It’s Not Rocket Science’; and Finger Paint’s ‘Comet’s Collar’. I used 3 coats on all of these and added a top coat of Color Club’s ‘Vivid’. On my thumb and ring finger, I’m sporting the Color Club green from 2009. On my index finger and pinky, that’s ‘It’s Not Rocket Science.’ And just on the middle finger is ‘Comet’s Collar’. As it so looks, the Color Club felt gritty but it sparkles. ‘It’s Not Rocket Science’ is a swampy green that was a hit last Fall. And ‘Comet’s Collar’ is new this season but doesn’t have much ‘umpf’ next to the other shades of green. I’d recommend ‘Comet’s Collar’ for nail art or stamping. For the Holiday look and feel, my vote is for the Color Club green. Which one do you like? These are my recent nail polish hauls. And it’s a haulage!! I got these at Sally’s. I wanted to get ‘Ingenue’ as well, but it was gone! These two polishes are from Orly’s Holiday Soiree collection. On the left, the gawdawesome ‘Androgynie’. The one on the right, that’s ‘Oui’. ‘Androgynie’…the final frontier. The baby lacey nail file is cute but utterly useles. ‘Oui’ to a gold and silvery-purple duochrome. Lovely shades. Nothing terribly new, but these are the shades of polish I like. You can see some ‘hot damn’ swatches of this collection at I Drink Nail Polish’s blog. This China Glaze collection is from the one called Eye Candy 3-D. I don’t know what the 3-D part is because these polishes have no more or less depth to them than any other glitters. But, maybe I missed getting the free 3-D glasses that should have come with these. I did get in on the sale at Ulta though. I bought 2 and got 1 free. At first, I was only going to get 5 but since that sixth one was free, I got them all. The first one above is called ‘Lorelei’s Tiara.’ That’s the one that has silver glitter and then some teal glitter swirling around within. That is one of the more unique looks. Next to that is ‘Marry A Millionaire’. Great saying that goes with a medium purple glitter with holo bar glitter. Another rather new look to me. And then the last one in this line up is a gold glitter; ‘Blonde Bombshell.’ This is the one I wasn’t going to get at first. It’s a gold glitter but has these larger sizes of gold glitter as well. I feel I have to get my nose right down into it to see the differences in the sizes, however. ‘Material Girl’ is a dusty pink glitter with larger sized pink holo glitter. Next is ‘Some Like It Haute.’ This one is another favorite. It’s a dark, slate gray and has holo glitter suspended in it. Last is ‘Love Marilyn’ and this is a gorgeous red glitter sprinkled with silver glitter. I know they are not the same and the only similarities can be they are both dark and have holo glitter. However, when you put them side by side, they actually bring out the unique flavor of each other. Blurred for shimmer, you can see both are full of holographic glitter. ‘Androgynie’ has the larger hex shaped pieces. On the left, ‘Orna-ment For Each Other’. Now that’s a Santa suit red! It’s got speckles of gold glitter within a sea of red glitter. Ho Ho Ho! And on the right, that’s ‘Glitter In My Stocking.’ It’s a bright gold glitter that has red and copper glitter thrown in for some major holiday awe-ness. They look like glitter tree ornaments, don’t they? There were a total of 4 shades to this collection. One was a fuchsia glitter (‘My Sleigh Is In The Shop) and the other was a bright blue with a rainbow assortment of colored micro-glitter called ‘Snowman of My Dreams.’ I hemmed and hawed over that one and I think I’ve convinced myself that I will have to go back and get it. I better get busy and Holiday Swatch! Do you have any of these or, are there some here that you know you’ll get? Seems like there has been a lot of ‘bird’ collections this season. That’s OK with me; these are some fine shades! Orly got into the game (bird, game…get it) early on. Maybe the early bird gets the worm? I like this taupe because it goes in my category of ‘pleasant surprises.’ ‘Night Owl’ is a taupe that would not bring attention to itself except for the taupe micro-glitter. I don’t have anything else like it in my collection. Not to say there isn’t one out there. I’m, however, happy to have this beauty. And the best part is, that the color in the bottle is exactly what I got on my nails. With 3 coats, I got a coverage that was complete and finished. I don’t have a top coat on this manicure; it was shiny all by itself. This could be the smoothest Orly polish I own. The glitter gives it a whole, new depth to it. And I must tell you, if it wasn’t for that micro-glitter, this would be a shade my grandma would have worn. Remember the taupe frost by Sally Hansen? Yea, it was grandma’s pick. I love my grandma with all my heart but, I don’t want to wear her nail polish. I’ll take this cutey, instead. I used to have a cashmere sweater this taupe color. Would you pick this shade to wear? I think this color would be a cool one for some boots! A couple of years after I moved to Virginia Beach, VA from Nashville, TN, I started dating a guy who managed a comic book/miniature collectibles/gaming store. I enjoyed hanging out there and looking at the vast array of items. One area that I enjoyed was the rows and rows of paint used to paint miniatures. Not only did I enjoy just looking at all the different colors, I was obsessed with the names of them; whimsical, silly and so comic-book style. But the one I remember is a green called ‘Ogre Snot.’ Besides being so hilarious, it popped into my mind, I could come up with names like that too. Hence, my love affair with giving colors names. The swatch I have for you today reminds of that time. I’m going to compare this year’s green from the China Glaze Halloween collection to last year’s green. Another side by side comparison. A close up of ‘It’s Alive.’ The glitter is larger and more of a moss green. The base color is a blackened green with light green glitter. I used 3 coats for each. I think 2 could have done it but since I wasn’t satisfied with ‘Zombie Zest’ and went for a third coat, I went ahead and did that third coat with ‘It’s Alive’ as well. From the left: China Glaze’s ‘It’s Alive’, China Glaze’s ‘Zombie Zest, Sinful Color’s ‘Call You Later’, Orly’s ‘It’s Not Rocket Science’. With the a passion for oogly-boogly color names like ‘Ogre’s Snot’, I found I had a fairly good creative talent for coming up with names. Any makeup company out there that would like my service, I’m very affordable!! What swampy green do you like? Even though my nails are really crappy right now, I shouldn’t let that stop me from posting swatches of past. Funny how I don’t think about posting when my current nail condition has nothing to do with past recorded manicures. I need to get over that one! Do I like Orly or, do I like China Glaze more? Hmmm…I don’t know if I can answer that one. I really like both of them. And I’m even harder pressed to chose one with the cool Holiday collections they gave us this year. I’m on a gold kick! Where I never would have imagined wearing something so presumptuous as gold polish, I am now enamored. This swatch is with Orly’s ‘Glitz and Glamour.’ Before you look at the photos, you just might want to put on a pair of dark shades; this gold has its high beams on. These photos were taken at the sunny window. The consistency of the polish fascinated me. I am pleased with myself that I was able to capture it with the camera. The polish is a gold base with more gold glitter in it than Liberace’s wardrobe. Orly was spot on by naming this ‘Glitz and Glamour’. I don’t think I could have topped that. And, if Liberace ever wore nail polish, I bet you bouillons to piano keys, he would have worn this. 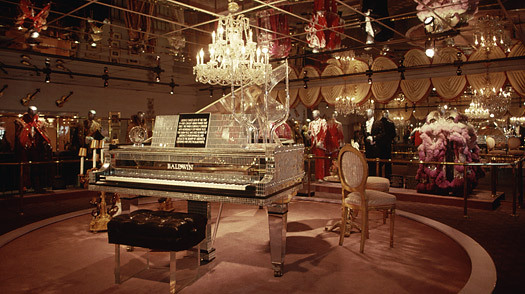 The Liberace museum, in Las Vegas, closed in mid-October. It was due to lack of tourist draw. And that’s quite sad. I grew up watching him on color TV at my grandparent’s house. What a performer. This was well before Madonna, Lady Gaga….hell, Cher had hardly taken off her fur vest yet! Ahhh, the innocence of being so young and only seeing Liberace for his performances; nothing else. Do you think this polish is aptly named? Are you old enough to remember seeing Liberace’s show on TV? I bet a good part of my followers are not. You might know who he is, hopefully. But sadly, that’s why the museum shut down; lack of an audience that remembers him. No cute build up before I reveal the finished work. Here it is right off the bat. I layered ‘Party Hearty’ over a French white tip by OPI. The surprise is that the red glitter are teeny stars! In a clear base it is mixed with different sizes of green glitter. I got this French white tip polish in a French mani set from OPI. I realllllly wish nail polish makers could make all their polishes in this size bottle. One, I could pretty much be sure I’d use up all the polish, two, I wouldn’t end up with globby, gunky polish near the end and three, I think the prices would come down. More for everybody!!! This is the experiment. On the thumb and middle finger, just ‘Party Hearty’ all by itself. To see if I could enhance the pizzazz, I used the OPI white on the index and ring finger. On the little finger I put on some Orly’s ‘Winter Wonderland’. I am going to try ‘Party Hearty’ with that one momentarily. However, this is 2 coats of ‘Party Hearty’ on each nail. I did just the pinky with this color. This is with two coats. Next I put 2 coats of ‘Party Hearty’ over that. At first, I was concerned that putting on the ‘Winter Wonderland’ and then the ‘Party Hearty’ was going to be over-kill. (Yes, smarties, I do know what over-kill is!!!) But you can see, that using ‘Winter Wonderland’ isn’t any different than my middle finger with no undercoat. I guess ‘Winter Wonderland’ will have to go on as its sheer self. Or, an overlay. Of course, it was a bear to take off! But I think it is a very Holiday ‘Party’ manicure. All this glitter too over the top for you? Do you know any ‘all or nothing’ types of people? How about those types that find something new and then just OD on it? Should you not like those characteristics in a person, well, you might want to just skip over this post. There has been a lot of ooohhhh’ing and awwwww’ing with the Christmas collections in ‘Nail Whoville.’ And, rightfully so. I don’t think I’ve changed my (nail) clothes this many times in one day since I was in high school! Honestly, I wasn’t a ‘wild child’. I had lots of fun but I wasn’t loose off the line like Lindsay Lohan or Britney Spears. And, about as ‘out there’ that I got was sporting some red, racy nail polish. I’m sure I had just one red color and wore it a lot. I still love to wear red nail polish. Makes me feel saucy! Wouldn’t it be blasphemy if a Holiday collection did not have a least one red in it? Yep, right up there with the Grinch that stole all the red nail polish! Shutter! Thankfully, we got reds, and are they saucalicious!!! Madness is right. I went a bit ‘squeee-ing’ over this one. Don’t know what ‘squeee-ing’ is? That’s what you do when you find those pair of shoes you have been wanting for 2 months and they are on clearance at 90% off and the only pair left is your size, and you’ve got them! Indoors or outdoors, this red wins. This is a dark, fuchsia that has red and lavender/purple micro glitter. Perfect color for a holiday party. I have on three coats. I put a third one on this morning because I had tip wear over night. No funny business; it just wore off. I think it was because I used Seche Prep instead of regular alcohol to prep for color. So, this jelly base polish didn’t wear long. Matted. This has a totally different attitude. OK, a cat hair got in there. Ugh…how’d that happen? Nail polishes, shine or matte, are of no concern when it comes to Libby and Sebastian. Just one coat of China Glaze Matte Magic. And it is magical. Matte shouldn’t be photographed in the direct sunlight. Naw…it is a softer side of vamp. It actually deserves candlelight. Hmmmm…I wonder if I can convince my hubs on that. I guess not. It was burrito night. Do you wear any reds for the Holidays? Got a favorite one? What ‘all or nothing’ attitude do you have?